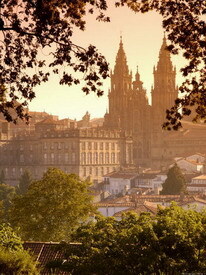 Santiago de Compostela is situated in the north west of Spain and is the capital of the autonomous region of Galicia. The inland city isn't too far from it's perhaps more famous neighbour La Coruña, a city which is a pleasant hour and half drive to the north. Santiago de Compostela, and more specifically the Cathedral there, is the final destination of the pilgrims of the Camino de Santiago, or the Way of Saint James. There are eight walking routes to Santiago that are all considered 'Ways to Santiago' but the most common route is called the Camino Frances or the French way. 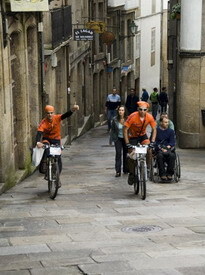 On completion of the walk (or cycle), pilgrims receive a certificate from the official Camino office in Santiago, which is just near the Cathedral. Imbedded in the cobbles in front of the Cathedral is a stone slab which marks the end of the walk. On this is depicted the traditional symbol of the end of the Way of Saint James - the scallop shell. In olden times, scallop shells were typically only found on the west coast of Spain, so producing the shell was enough to prove that the walk had been completed. The shell is now synonymous with Santiago, and even the ornate Cathedral door is adorned with brass copies. What I flippantly used in primary school to mix paints, and in later years to deposit the butts of sneaky cigarettes, the scallop shell has a very different place in my heart and mind now. We arrived in the airport in Santiago which would be similar, if not a little smaller, than the "National" airport of Cork, where we were met by a representative of Turismo de Santiago de Compostela, the city's Tourist Board. 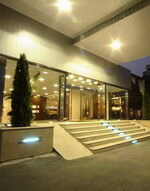 A short 20 minute coach drive through picturesque countryside brings us to our hotel in the centre of Santiago. THE CITY Santiago de Compostela (which means Saint James of Compostela) is built around the magnificent St James Cathedral. Small streets and walkways radiate out from the main square in front of the Cathedral, Praza do Obradoiro (or Workplace Square), and almost everywhere ultimately leads to the Cathedral. The intertwined streets create cosy corners where café tables and chairs are dotted on the footpaths, creating a uniquely Spanish ambiance - lively yet laid back. Also, as a major bonus, a large coffee will only set you back €1.50 - and there wasn't a Starbucks in sight! Santiago is surprisingly easy to get around - a very basic map from the Santiago Tourist Office is a perfect accompaniment. On the Saturday after arriving in Santiago, I went to explore the Cathedral. It's a wonderful building with massive high ceilings, elaborate decorations and exquisitely crafted statues and effigies. But the crowds at 4pm were stifling, and the queues to pray at the tomb of St James had the most of the church taken over. An early Sunday morning trip proved more profitable, as only a handful of mass going locals were present, and the true majesty of the building was clear to see. The tomb of St James is actually a small silver casket, encased behind a granite and glass barrier at the back of the main alter, which created a very respectful area in which to pray or just admire your surroundings. A sure fire recommendation on any trip to Santiago is to take a guided tour of the roofs of the Cathedral. Immensely interesting, it also gives the traveller some bearing on their whereabouts in the City with an awe inspiring panoramic view. The Cathedral is made up of all different sizes of structures and varying heights of roofs, the highest reaching 30 metres. The pilgrims in the Middle Ages visited the roofs after completing the walk of Saint James, but the structure has been made considerably safer than back then by barriers and hand rails. There are quite a lot of steep narrow steps before reaching the roofs, so bad footing, vertigo and fear of heights should be checked at the door. The Cathedral and its surroundings are considered to be in the 'Old' part of the city, and the 'New' part is instantly recognisable. This is where Zara and Massimiso Dutti have their stores, all the banks and post offices, supermarkets and estate agents. Basically it's the working part of Santiago, it's functional and has little character when compared with Santiago 'Old', but it's very interesting to see how the two parts rely on each other and work well together. A trait that the old and new quarters of the city share is the beautiful parks and gardens dotted all around Santiago, that make for very pleasant strolls. Although not a fantastic shopping city, you will find some lovely pieces of silver jewellery, and some unusual household utensils and ornaments. A fact that can be easily overlooked about Santiago, especially when viewing it as a holiday option, is that it is a thriving University city. 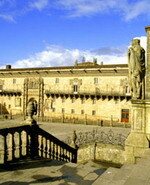 Listed as one of the oldest Universities in the world, Universidade de Santiago de Compostela brings almost 30,000 students to the City every year and is particularly noted for its Faculty of Medicine. Talk of a University town must mean that there is a flourishing night life, so in the interest of my J. Barter colleagues gaining a rounded insight into this potentially lucrative destination, I conducted an indepth study of the leisure habits of the Galician youth. There are hundreds of pubs, night clubs and tapas bars in Santiago, and like any other European city, whatever you like you'll find it there - traditional music, dj's, live bands etc. Interestingly, even tough it's permitted to smoke indoors, I never came across a smog fest that could compare to Ireland pre 2004. For a quiet drink after a big meal, we were brought to an Old Town pub, which by one of our tour guides was vehemently sold to us as an Irish pub, and by another guide as a staunch Galician pub, which would lead you to believe that there's little difference between the two cultures. Testament to this was the live sounds of the fiddle and flute wafting from the walls of Santiago's watering holes. Galician traditional music is uncannily similar to Irish music, and over a few pints there was a connection made with Santiago and St. James Gate, home of Guinness. This, however, I'm quick to point out, was never corroborated in the daytime. Food is very seafood based, but most restaurants will cater for those who don't eat fish, and vegetarians. It's important to ask though, as many menus won't detail the vegetarian option. Yummy alternatives to fish and meat include stir fried vegetables, vegetarian Spanish omelette and scrambled eggs with vegetables. 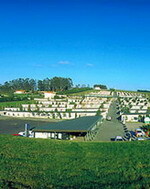 Most of the wines served in Santiago are from local Galician wineries - every variety is superb, and reasonably priced. Pubs: Casa das Crechas - on Vía Sacra, which loosely translated means House of the Curly Haired Girl, features live traditional Galician music and a slightly arty and relaxed ambiance. 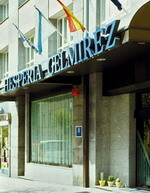 Restaurants: Casa Rosalía - on Rua do Franco is a relaxed and informal restaurant and tapas bar with varied menu. Restaurant Exebre - basement restaurant in the 5* Parador Hotel, adjacent to the Cathedral, lengthy menu and lovely staff. 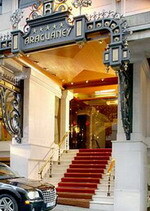 Casino - Café and bar on Rua do Villar. Beautiful high ceilings and an opulent feel to this place, but still a cool place to chill out with a coffee, in the centre of the old town Restaurante Carretas - In Carretas, just a short walk from the San Francisco Hotel, beautiful beef here! Restaurante Don Gaiferos - on Rua Nova, near Cathedral - lovely menu, more meat than fish options here, all perfectly cooked to order. Fabulous dessert selection! 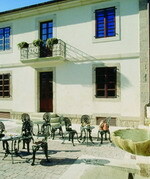 Pazo de Adrán - a 20 min drive south from Santiago, this cosy restaurant was once a manor house. Pandemonium - a new restaurant in the coastal region of O Grove, an hour or so south west of Santiago. Lovely finish to a day trip to the coast, food is a contemporary take on Galician cuisine. We stayed in the San Francisco 4* Hotel (www.sanfranciscohm.com), which is a historically recognised building. Originally a monastery, now over half of the building has been tastefully converted into a hotel and the other part is still home to several monks. The walls of the corridors expose local granite and a mix of wooden, glass and slate floors throughout successfully marry ancient and contemporary styling. 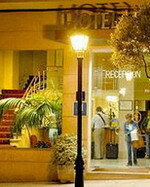 The rooms are spacious with all expected amenities including spacious en suite, TV, safe and hairdryer. 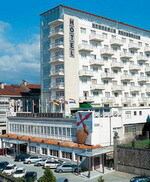 The small swimming pool and Jacuzzi is located just outside the main building in a separate newly built structure. A tour of the monastery can be requested at reception, but it is possible to just stroll around the main communal areas unassisted. The banquet hall hosts parties and weddings of any size and in my view would be a worthy contender in the weddings abroad market.